The SV12 is a small, highly adaptable milling machine which provides a fitting companion to the 102 lathe within a toolroom setting. 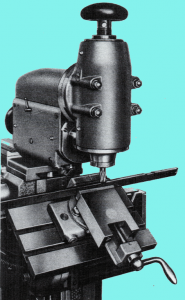 Much of the SV12’s specifications and tooling correspond with the 102 lathe throughout its construction, including the use of the 102 bevel profile bed and W20 collets. 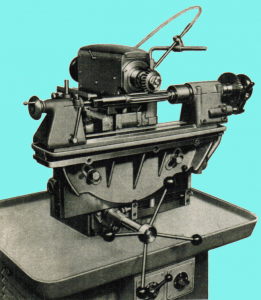 The contemporaneous SV90 lathe is similarly referenced in the center height of the horizontal spindle headstock and table mounted, dividing headstock. For a machine of 450 kg weight, the SV12’s capacity is diminutive. The table travel is 200 mm in both the vertical and horizontal axis with 120 mm permitted by the headstock slide. The latter benefits from the ability of the horizontal spindle headstock to be variably positioned along the length of a 102 bed profile. This permits positioning of the cutter relative to the workpiece and required travel. While there is no quill, the horizontal slide may be hand actuated by the inclusion of a rack and pinion lever assembly. The change between lever and lead-screw advancement is easily and quickly accomplished. This latter feature also applies to the horizontal headstock. 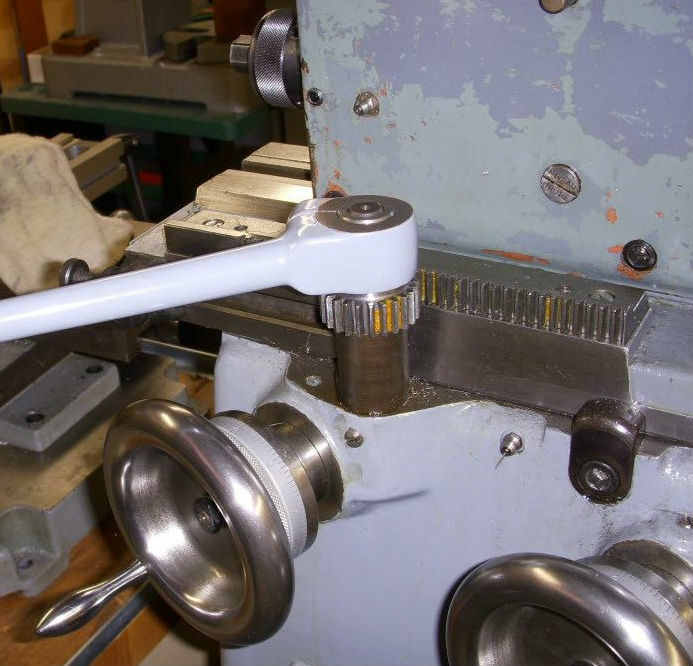 By loosening a single screw coupling the leadscrew to the slide and placing the pinion lever on to its pivot the permanently fixed rack can be engaged. For the longitudinal slide a star-wheel with pinion engaging with a rack on the slide could be attached. Drive to the horizontal headstock is provided from either a single or two speed motor housed in the cabinet base. A three-groove pulley on the motor drives, via V-belt, a corresponding pulley on a countershaft from which a two-groove pulley takes power to the headstock. 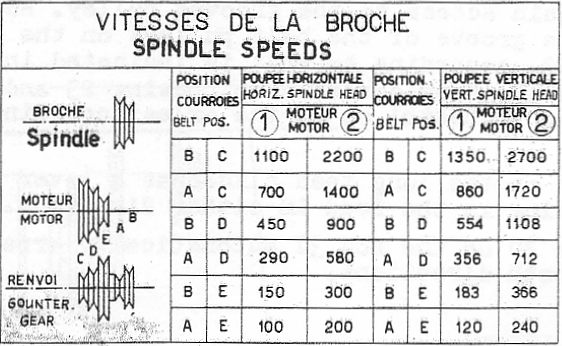 Thus, either six or twelve spindle speeds (see below) are obtainable depending on whether a single or two speed motor is fitted. At the headstock a pair of straight-cut bevel gears takes power from the pulley shaft to the horizontal spindle and from here pair of helical spur gears provide motion to the vertical head or slotting head when fitted. Both the horizontal and vertical headstocks have Morse taper 4 spindles and a range of tooling including horizontal arbors and stub milling arbors was available. Other tooling included Morse taper reduction bushes and an E40 (similar to ER40) collet chuck. Each machine was supplied with a 4MT to W20 collet adapter sleeve and drawbar as part of the standard equipment. 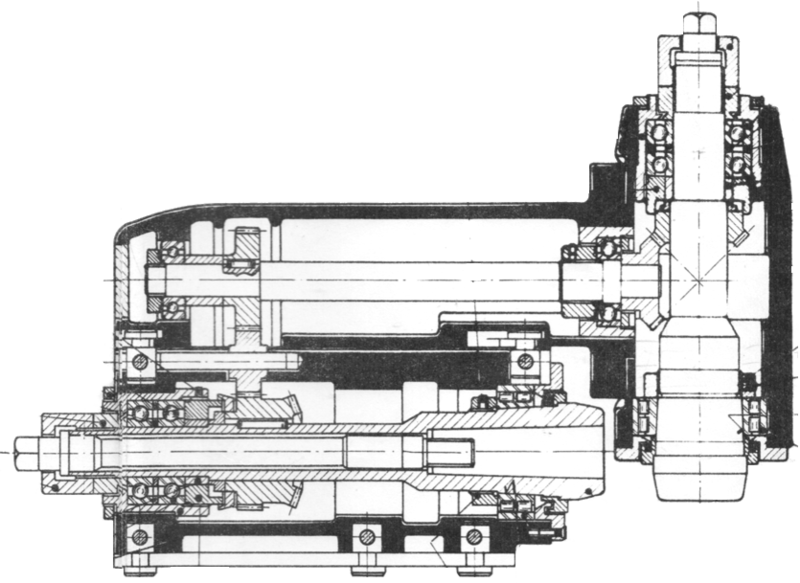 The spindle bearing arrangement for both the horizontal and vertical heads is identical to that employed on the 102 with a double row roller bearing at the front and two ball races at the rear. The horizontal headstock forms an oil bath for the lubrication of the gears and bearings, but also has the advantage of splash lubricating the drive for the vertical head or slotting head. Power feed to the longitudinal slide was available as an optional accessory. A telescopic cardan shaft takes power from a column located toward the rear of the machine to a casting fitted to the end of the slide. Here a lever operated clutch and gear mechanism transmits forward and reverse feeds to the feed-screw. Adjustable knock-out stops allow automatic disengagement of feeds. 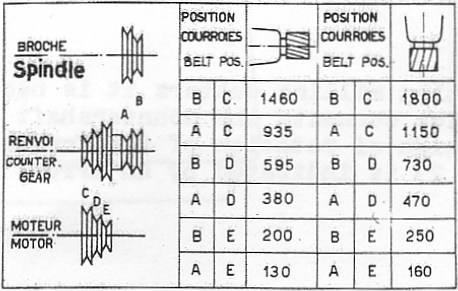 Driven from the machine’s spindle motor, eight rates of feed (sixteen with a two speed motor) can be varied through the position of a round belt on a pair of four-stepped pulleys and by exchanging position of a pair of gears in the rear of the column. One disadvantage of such a system is that if the direction of the motor is reversed then the round drive belt to the feed mechanism has to be twisted to maintain the correct rotation of the feed mechanism. A wide variety of accessories allow the SV12 to capably be utilized in a wide variety of tasks. These include a swiveling, vertical headstock; 46 mm stroke, slotting headstock; dividing head with indexing capability; semi-circular table; inclinable table; inclinable quill-holder; and 210 mm diameter rotary table. Coolant is accommodated by a reservoir and drain cast into the base with a self contained motorised pump. Some tooling items were designed with multiple mounting options. Thus, the rotary table could be mounted to the swiveling saddle as well as the inclinable table. The W20 quill fits both the dividing headstock and the swiveling quill-holder. This allows a variety of configurations based on users’ needs and tooling availability. Of particular benefit to toolmakers is the ability to mount a workpiece between centers and angle + / – 5 degrees as well as swivel + / – 5 degrees using the angle bracket. These movements are well suited to the manufacture of reamers, alternating milling cutter teeth and the like. Available evidence supports that the SV12 went through a near constant design progression throughout its manufactured life. The most drastic design changes most likely were made early in its presentation. The vast majority of machines seen on the used market date between the late 1940’s and 1960. Even within this period, small differences between components are likely to be found: bearing mounting configuration, minor assembly changes, etc. 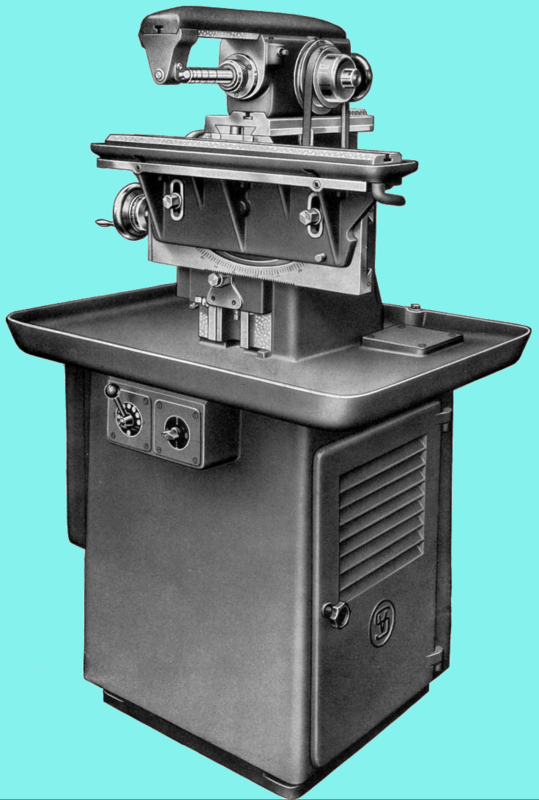 Significantly, the last machines made in the 1960s had taller bodies giving a longer vertical stroke and hence more capacity under the cutter. 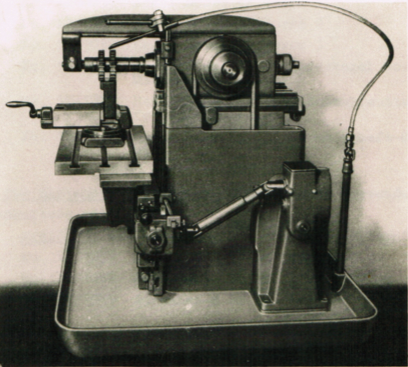 The video below shows the restoration of a Schaublin 12 milling machine – note that the use of grease is acceptable for assembly purposes, but spindle bearings must be oiled when the machine is in service.